UofL students, faculty & staff willing to forgo the right to a parking permit for the following two years were eligible to receive a $400 voucher to an area bike shop from 2012-2016. NOTICE: Due to severe budget cuts, UofL's Earn-A-Bike Program was indefinitely suspended in 2017. In spite of the difficult financial situation, the UofL Sustainability Council had hoped that the program might be able to continue at some level. Unfortunately, the Administration has decided to indefinitely suspend all dedicated funding for the Earn-A-Bike Program. We are continuing discussions with other units on campus to see if some level of funding could be restored to relaunch the program in some form at some point in the future. In the meantime, we encourage you to take advantage of all the transportation alternatives offered at UofL, especially the free UofL BikeShare Program and the city-wide LouVelo BikeShare network with stations at UofL's HSC and Belknap Campuses (and 50%-off monthly memberships for everyone at UofL using your @louisville.edu email address!). UofL’s Sustainability Council accepted applications every summer 2012-2016 from those willing to not drive to campus and to give up the right to a parking permit for the following two years in exchange for a $400 voucher to area bike shops. The primary intent of this program was to get people out of the habit of driving to campus, and to start new folks to campus off with car-free habits. Anyone with a valid UofL ID who was willing to get to campus without driving (i.e. bike, walk, skate, bus, carpool, or vanpool) and to formally give up the right to a parking permit for the following two years was eligible to apply to receive a $400 voucher to several local bike shops. Vouchers could be redeemed for a new bike, helmet, and lock, or to fix-up and equip your bike for year-round commuting with lights, racks, bags, etc. This was an ANNUAL program with a new round of voucher distributions occurring at the beginning of each Fall semester. Those who were not accepted or unable to make the commitment any given year could reapply the following year. This was NOT a first-come, first-served program. Those who planned to purchase a parking permit for Fall, but had not yet done so, were encouraged to wait until AFTER purchasing their permit to complete an application, as the permit number was needed to apply. UofL's Sustainability Council operated the Earn-A-Bike program from fall 2012 to fall 2016 as part of our Climate Action Plan to reduce greenhouse gas emissions and to encourage students and employees to adopt bicycling for transportation as a healthy lifestyle. Enthusiasm for this program was outstanding, with a total of 3744 applicants and 1908 vouchers being distributed over the five years! A record 850 UofL students, faculty, and staff expressed willingness to commit to not driving to campus for at least two years by applying for the program in 2015. Similar numbers of applicants were processed in the first three years of the program, as well. 560 individuals applied in 2016. Rewarding individuals for not driving to campus. Everyone coming to UofL is encouraged to consider walking, skating, bicycling, taking the TARC bus (free with UofL ID! ), carpooling, or vanpooling. Those needing a car once they're on campus can rent one from our fuel-efficient fleet for a low hourly rate through the UofL CarShare program. Bikes can also be checked out free for the day from 11 campus locations through the UofL BikeShare program. Full details on all of these transportation alternatives here. UofL’s Sustainability Council had a limited annual budget of $160,000 for this program. 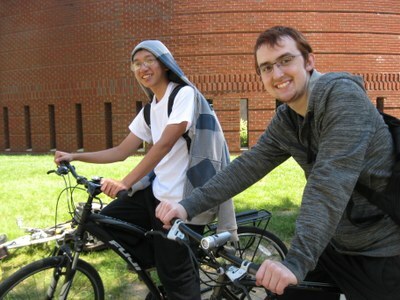 Each August, the program offered a limited number of bike shop vouchers to those willing to use alternative means of getting to campus other than driving. 4. To pick-up your voucher, you must attend a one-hour orientation and safety session which will be held at a variety of times and days of the week on both Belknap campus and at the Health Sciences Center at the beginning of the fall semester. That is how you EARNED your voucher. There were no exceptions or partial commitments allowed. If you could not fully abide by the terms of this agreement for the following two years, you were asked not to apply. 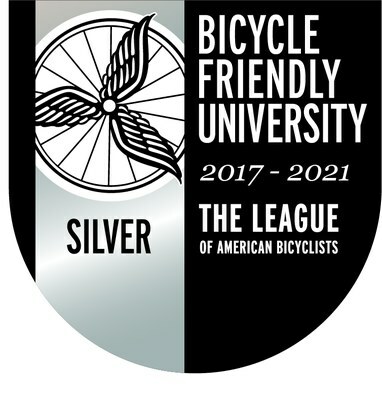 UofL is a bike-friendly university! 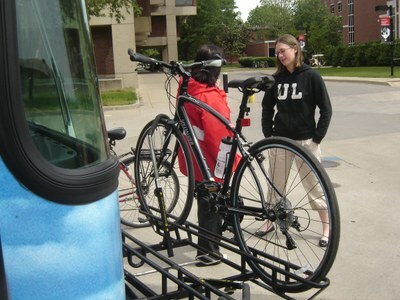 More tips and resources for biking to UofL here. Once the deadline for application had passed each year, vouchers were distributed to eligible applicants based on a prioritization scheme designed to create the greatest impact in terms of changing behavior and reaching as many people as possible. Top priority was given to current UofL parking permit holders, then former UofL parking permit holders, then all others. Those new to campus were given special consideration. Former program beneficiaries were given lowest priority. Those students, faculty and staff who were qualified and selected were notified via email just after the application deadline that they were eligible to pick up a voucher worth up to $400 (sales tax-exempt), to be used at designated local bike shops (not online retailers, discounters, or big box stores - UofL is committed to supporting a vibrant, sustainable local economy and we know you will value the quality products and services available at local shops). Each voucher was intended to cover the costs of a reliable, basic commuter bicycle, helmet and U-lock, but could be used to purchase any bicycling-related products or services offered by the shops. Recipients could get a new bike, or fix-up and equip one they had for year-round commuting with fenders, lights, baskets, racks, pannier bags, a pump, maintenance tools, lubricant, spare parts, tubes and tire liners, etc. Those who accepted a voucher had to return to the Parking Office any current UofL parking permits and were not eligible to purchase a new permit for two full calendar years.If you could not make this long-term commitment and thought you might want a permit in the future due to changes in weather, relocation, medical issues, theft of your bike, future availability of reserved parking spots, etc. then this program was NOT for you! To pick up vouchers, accepted applicants had to attend one of several one-hour orientation and safety sessions. A complete schedule and link to register for these sessions was sent with the program acceptance email. Sessions were made available at a variety of times and days of the week on both Belknap campus and at the Health Sciences Center. Vouchers could only be redeemed by the recipient. They were non-transferable. You had tot present your UofL ID and submit your voucher to the bike shop at the time of purchase. Vouchers could not be combined because the goal was to get more people on bikes. Vouchers had no cash value. No change or gift cards would be issued. Any unused portion of the $400 value of the voucher was used by the university for other related programs. Vouchers expired within three months of issue. Each voucher could only be used for one transaction at one bike shop. If lost, vouchers could not be replaced. Treat them like cash. Voucher users could choose to spend additional personal funds (though they were subject to sales tax), or to not redeem the full amount of the voucher. 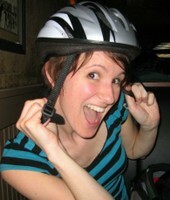 Participants were encouraged to get whatever they need to be safe and comfortable commuting year-round by bike. This UofL Bike Map covers all three UofL campuses and indicates where to find bike parking, fix-it stations, and bikeshare check-out locations! RED icons = COVERED bike parking. BLUE icons = exposed bike parking. YELLOW wrench icons = Bike Fix-It stations with tools and pump. GREEN Bike icons = UofL BikeShare locations from which bikes can be checked-out free for the day with UofL ID.